Engineering is one of the most challenging and most rewarding science disciplines to study. Engineering may not be amongst the easiest courses to study, but anyone looking to be directly a part of an ever-changing world, ranging from design, machines and structures, construction to the power sector, will find a home in one of the several different branches of engineering. Engineers are always in demand, and landing a job in any engineering related field is easy as the skills that are imparted and acquired during study is invaluable and an asset. Since our global economy is extremely competitive, any willing and vibrant person must go beyond the traditional ways in order to succeed. Anyone can earn world-class credentials by studying any engineering degree online. There are a number of universities that make this possible. This university is ranked among the best online graduate programs by the U.S News and World Report and is a winner of the 2012 Outstanding Online Program Award from Sloan-C. It offers Master’s programs which include Bioinformatics, Cyber Security, Computer Engineering, Electrical Engineering, Industrial Engineering, Manufacturing Engineering, Cyber Security – Organizational Behavior, and Systems and Analytics. The university also offers Certificates in Bioinformatics and Project Management. Moreover, 3-Course Immersion Certificates allow students to receive 9 credits that can be applied to a Master’s degree program and a certificate of Completion. Tuition costs $1,452 per credit. 2. North Carolina State University. This university is ranked among the top Best Online Engineering Programs by the U.S News and World Report. It offers fifteen Computer Science and Engineering Master’s Programs. The graduate degrees offered include; Master of Science (M.S) in Aerospace Engineering, M.S. in Chemical Engineering, M.S. in Civil Engineering, M.S in Computer Engineering, M.S in Computer Network, M.S in Computer Science, M.S. in Electrical Engineering, M.S in Engineering, M.S. in Environmental Engineering, M.S in Integrated Manufacturing Systems Engineering, M.S in Nanoengineering, M.S in Material Science and Engineering, M.S. in Industrial Engineering, M.S in Systems Engineering and M.S in Nuclear Engineering and many more. Graduate non-degree studies are also offered. Tuition costs $374 per credit for in-state students and $748 dollars per credit for out of state students. 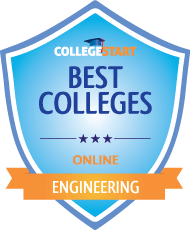 The university is ranked #2 among the Best Online Engineering programs by the U.S News and World Report. Its online engineering program is divided into various departments. These include; Applied physics and Applied Maths, Biomedical Engineering, Chemical Engineering, Civil Engineering, Computer Engineering Program, Computer Science, Earth and Environmental Engineering, Electrical Engineering, Industrial Engineering and Operation Material and Mechanical Engineering. Master’s degrees are available from each department. Tuition costs $1,710 per credit regardless of residency status. This private institution is ranked among the top Best Online Engineering programs by the U.S News and World Report. It offers a 30 credit program for a Masters of Engineering. Masters of Engineering degrees are available for; Aerospace Engineering, Biomedical Engineering, Civil and Environmental Engineering, Electrical and Computer Engineering, Engineering Mechanics, Geological Sciences, Mechanical Engineering, Systems Engineering, Biological and Environmental Engineering, Chemical Engineering, Computer Science, Engineering Management, Engineering Physics, Materials Science and Engineering, Operations Research and Information Technology. Masters of Engineering Minors are offered in; Bioengineering, Engineering Management, Manufacturing and Systems Engineering. Concentrations are offered as well. Tuition costs $1,960 per credit. This university is ranked among the Best Online Engineering Programs by the U.S News and World Report. It offers Master Degree programs in many areas such as; Ocean Engineering, Computer Engineering, Civil Engineering, Environmental Sciences and Engineering, Electrical Engineering, Systems Engineering and Aerospace Engineering. Certificates are also offered in areas such as Nuclear Engineering. Tuition costs depend on residency. Costs per credit for in-state students is $717. This figure rises to $1,391 per credit for out of state students. The best part is that the program incorporates real world practical experience with fundamental concepts acquired in class. There is industry standard simulation equipment in the labs integrated with practical hardware providing the learner with the relevant skills required in the modern industry. The standards are high, and thus the students are easily and quickly absorbed in the market. Some of the best managers in the industries at the moment are engineers. Pursuing a Bachelor of Science in Engineering (BSE) in E.M (Engineering Management) equips the learner with leadership skills and superb managerial qualities of any engineering industry. This course horns and equips one with excellent managerial skills.